The FixLogix standard metric component kit for modular CMM fixtures is the most effective and economical fixture system on the market today. An uncommonly wide variety of components such as vertical towers and swivel-heads are provided to improve setup flexibility. FixLogix components are compatible with our t-slot fixture plates, and with other M6 threaded grid plate systems. 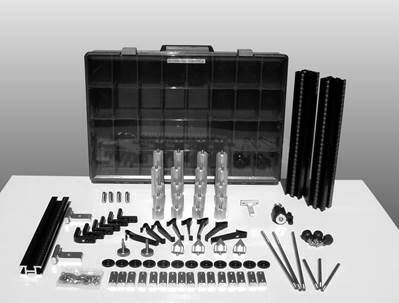 Our components are predominantly stainless steel and anodized aluminum for corrosion resistance. (2) #MCLR300: 300mm vertical linear riser, laser engraved, w/ six t-slots: 2 x 2 + 1 x 1.